Government statistics identify around 70,000 social enterprises in the UK, contributing £24 billion to the economy. What makes a successful social enterprise? First and foremost, they need to be a good enterprise! Ultimately a social enterprise is a business and like any conventional business it needs to be good at what it does whether it’s selling coffee or providing health and social care services. They differ from conventional businesses in that this enterprise is done for a social purpose – so the more profit they make, or the larger they get, the more they can positively impact on people’s lives whether that’s through who they employ or how they use their profits. The best social enterprises combine the two really well, delivering great business solutions that deliver real impact on people, communities and the environment. Is social entrepreneurship becoming more popular? Definitely. We’re seeing a start-up boom with close to half of all social enterprises being five years old or less. They are growing three times faster than conventional SMEs, and the social enterprise model is appealing to more and more younger entrepreneurs who want to set up a business and make a real difference to their communities and the wider world. What does Social Enterprise UK do? We’re the membership body for social enterprises and exist to champion the amazing work they are doing. It’s our goal to build the markets for social enterprises in the areas that they operate in, working with the public and private sectors to bring them into supply chains. 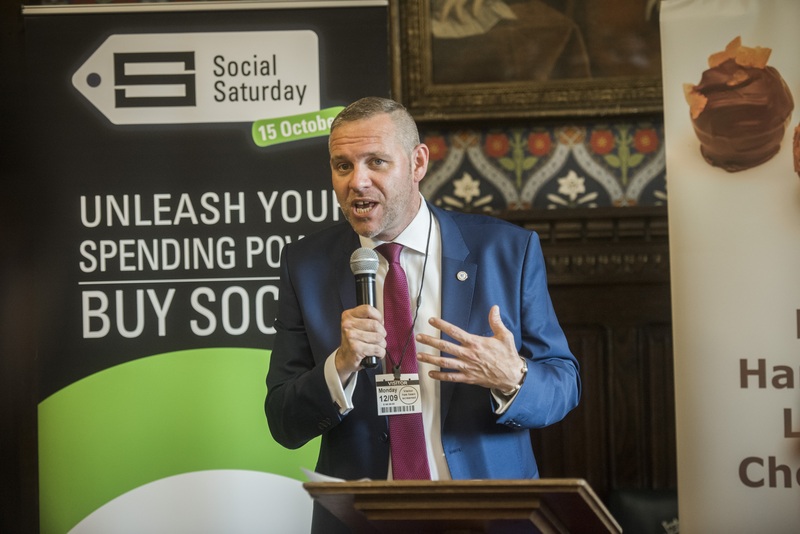 One of the main things we do is awareness raising, running big public facing campaigns, like Social Saturday, and lobbying government to create a policy environment in which social enterprises can flourish. This year we launched the Buy Social Corporate Challenge – a ground-breaking initiative in which big corporates will aim to spend £1 billion with social enterprises by 2020. It has the potential to be a game changer. At a local level our Social Enterprise Places Programme aims to help nurture and build strong social enterprise communities working with local authorities, social enterprises and other businesses to recognise hotspots of social enterprise activity. What are some of the challenges that social enterprises face and how do you help? Many of the challenges that social enterprises face are similar to those of small businesses with access to finance, lack of capacity and lack of specialist skills all common issues. There are a number of market specific issues too – around 59% of social enterprises trade with the public sector, yet public service markets are getting harder for smaller organisations to access as commissioners look to de-risk through large outsourcers. We’re trying to put social value at the heart of commissioning decisions, and were behind the Social Value Act in 2012 which requires public bodies to think about the impact of the services they commission on their communities. We believe this will help deliver better public services by avoiding the “race to the bottom” created by a focus on price that leads to poor wages and a loss of economic value for the local economy. In the private sector, some large businesses are hesitant to buy from social enterprises for fear that they won’t be able to meet orders, or deliver effective services. We work closely with businesses to show that not only is buying from social enterprises the right thing to do but also that there’s a strong business case to do so. More and more businesses are realising that bringing social enterprises into supply chains is a way to meet their own CSR objectives and have a positive impact on the communities they work in. Of course social enterprises operate in the wider economy so the uncertainties posed by Brexit are also an issue. What’s the most unique social enterprise you’ve come across? That’s a tough question, but one which comes to mind is Fair for You, a social enterprise which sprung onto the scene to do something about the predatory behaviour of high cost weekly payment stores. They offer flexible repayment plans, affordable prices, don’t take a deposit and there are no hidden fees. They’ve only been around two years but are already having a massive impact on low income communities. Nearly half of all their customers have said that using Fair for You has improved their ability to cope with their day to day running of their home in a big way. Fair for You shows how a social enterprise can disrupt what is a dysfunctional market, transforming it to have a positive impact on people’s lives. One of the most interesting things I saw recently was a sugar bowl from the 1790’s which had the words ‘East India Sugar, not made by slaves’. Its centuries old but it shows there’s always been a thirst amongst consumers to buy ethically. In a way those early abolitionists were pioneers of the social enterprise movement! There’s no shortage of successful social enterprises and as a membership body I shouldn’t focus on any particular one! Readers should check out the shortlist for this year’s UK Social Enterprise Awards to see some of the best the sector has to offer. What I will say is that there are pioneering social enterprises in nearly all sectors who are shifting markets, taking on established players and showing another way of doing business is possible. Social Saturday takes place on 15th October this year. What have you got planned? Loads! It’s a nationwide campaign so there will be events put on by social enterprises up and down the country. You can find out what’s happening near you by visiting the Social Saturday website – www.socialsaturday.org.uk. There’ll be a social enterprise pop up stalls, cookery demonstrations, open days, networking events and much more. It’s a great chance for members of the public to find out more about the social enterprises in their local communities and to learn about how they are transforming lives. There’s also a Buy Social Marketplace on the site, where consumers can find social enterprise products from coffee and chocolate to baby grows and furniture. How crucial is it to use Social Saturday to create awareness among consumers that they can make a social choice with the businesses they use? I think people are generally pretty fed-up of hearing about big businesses getting up to no good. Whether it’s tax avoidance or low pay, corporate bad behaviour is headline news. Research shows that one in three people feel ashamed at buying from socially irresponsible businesses, and there’s a real desire amongst consumers to spend their money on organisations that are giving something back. Social enterprises are the perfect antidote for a weary public! Social Saturday is all about raising awareness that these businesses are out there in your communities, doing good and changing lives. Awareness is on the up, but there’s still some way to go. A few years back no-one had heard of Fairtrade, it’s now everywhere, if we do this interview again in a couple of years we want people to be looking at businesses and asking – are you a social enterprise? You’ve had some fantastic support in the past from 10 Downing Street, Jamie Oliver, Chris Addison and even FC United of Manchester. How important is it that influential names get behind Social Saturday? Having big names participating in the campaign is of course important but the real stars of the campaign have got to be the social enterprises themselves. Where celebrity involvement comes into its own though is on social media – they can just reach people we’d struggle to without their involvement. When it comes to spreading the message and engaging the public, celebrities are a great in carrying the message beyond the usual crowd. How can businesses get involved in Social Saturday? Social Saturday is not just about consumers. Businesses can buy social too and there’s never been a better time to get social enterprises into your supply chains. Over half of social enterprises trade with the private sector – offering goods and services at competitive prices whilst using their profits for social good. One of our members, WildHearts Office sells everyday office stationary but through buying from them you help fund micro loans for entrepreneurs in the developing world and support young people in the UK too. Of course we buy from them but so do major corporates like Johnson and Johnson, Zurich and Deloitte. You can get your office cleaning services from social enterprises like Brighter Environment – who create employment opportunities for the long term unemployed, your coffee from Cafédirect, your water from Belu (who donate 100% of their profits to WaterAid) and much much more. Think about what, as an organisation you’re spending your money on – chances are there’ll be a social enterprise supplier out there providing the same thing but with an added social impact. Buying from social enterprises is a way of using money you would have been spending anyway in a positive way – it doesn’t just make moral sense, it makes business sense as well. If you had three pieces of advice for someone considering setting up a social enterprise what would they be? Make sure you understand the needs of your customers and the market, never forget the numbers – you can’t have an impact if you’re insolvent, and remember that the very best social enterprises never compromise on their values. Interested in starting a social enterprise? Read our tips.